A grand tour through the post-apocalyptic world of 1948, from the drowned East Coast to the Soviet empire behind the Serpent Curtain - including the Top Five Places to Be Attacked by Pirates, the Top Five Places to Find A Remote Castle Ruled by a Madman, and much more! 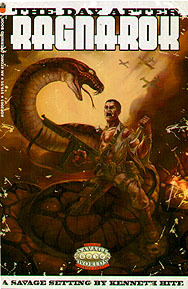 Stats for more than thirty foes to shoot, stab, or sneak past: Serpent cultists, Spetsnaz troopers, swamp devils, and... snakes! Giant, 80-foot long snakes, that is! Over 20 pages of pure adventures: Four campaign types, each with a sample campaign laid out in nine scenario seeds. A massive Adventure Generator, helping you build every tale from the Hook to the Henchmen to the Twist ending! Four worked examples, taking the Adventure Generator's raw numbers and running with them.